So you know how much I love you? So much so that I have been collecting my beauty trash for the past few weeks, just so I can review it for you guys :D.
Price: varies from drugstore to drugstore-super affordable though. Availability: this can be purchased at a variety of drugstores, the H.E.B near me always carries this. I received this in an ipsy bag a few months ago. The texture and consistency of this body butter was exactly what I needed, it was thick enough to be useful during the winter months, yet light enough that it didn’t make me a sticky mess. And this coming from a person with dry skin problems is a high enough compliment. About the scent: I was first very into the whole exotic scent of the guava. Being the Indian that I am, I used to love eating guavas whenever the season arrived back home. However, after a few uses, I suddenly started finding the scent too artificial and sickly sweet. I don’t know if it happened with others who have tried this or if it is just my freaky nose. As far as repurchasing goes, I won’t be specifically shopping for this product. I don’t have much to say about this. This lotion has a light formula, prefect for summer. The consistency is thin enough that it is easy for application. The scent of this lotion is very light and wears off after about a couple of hours from application. All in all, it is a decent product if you’re in a hurry and just looking to grab a functional body lotion. I also received this in an ipsy bag. I absolutely love this exfoliant. I am very into scrubs and exfoliators because I have extremely dull and dry skin and I feel like exfoliators just give my skin new life. This one in particular has an amazing consistency. The exfoliating beads are so small that they are not gritty or terrifyingly harsh on the skin. Yet, it is so strong that your skin will be scrubbed clean of all the worries of the world. As far as repurchasing goes, being the hoarder that I am, I have so many similar products that I am trying to get through those before I go ahead and buy this one again. Highly recommend this though. I have always been a big fan of anything Bath and Body Works and their body lotions are no exception. Again, this one has that light liquid consistency (not watery by any means). The selling point of this lotion is this fragrance, it is absolutely divine. It is a very fresh scent and the fragrance wears amazing on the skin throughout the day. This was another ipsy product. I will only say this: before using this, I used to think that hand creams are an unnecessary gimmick. Clearly, this product has changed my world view on hand creams. The consistency is without a doubt, ultra nourishing and rich, without a hint of greasiness. This scent reminds me of when I was little and my father, sister and me would sneak into the kitchen and eat strawberry ice cream in the middle of the night. This scent is, as the packaging says, absolutely delectable. You’ll find yourself wanting to smell your hands all day long. I can’t think of what else you would want in a hand cream. This is one of my most favorite ipsy finds. Before I tried this moisturizer, I did not comprehend the difference between hydrating lotions and moisturizing lotions. Like I mentioned above, I suffer from permanently dry skin. I am one of those people who have to constantly reapply lotion in order to stop dry flakes from showing up on their skin, especially around the nose. This lotion is literally like you are slapping on gallons of water on your face. It is very cooling and refreshing and leaves your skin feeling hydrated and soothed. As soon as I use up some of my current face moisturizers, I’m going to hunt this baby down and fall in love with it all over again.I realize this might be too much of a read for some of you or too little for some. But that’s the thing about empties, the fact that you use up the entire product usually makes it possible to give good in-depth reviews about the products. Do not be discouraged that there are many ipsy samples in this review; it is just easier for me to use up those travel sized products. 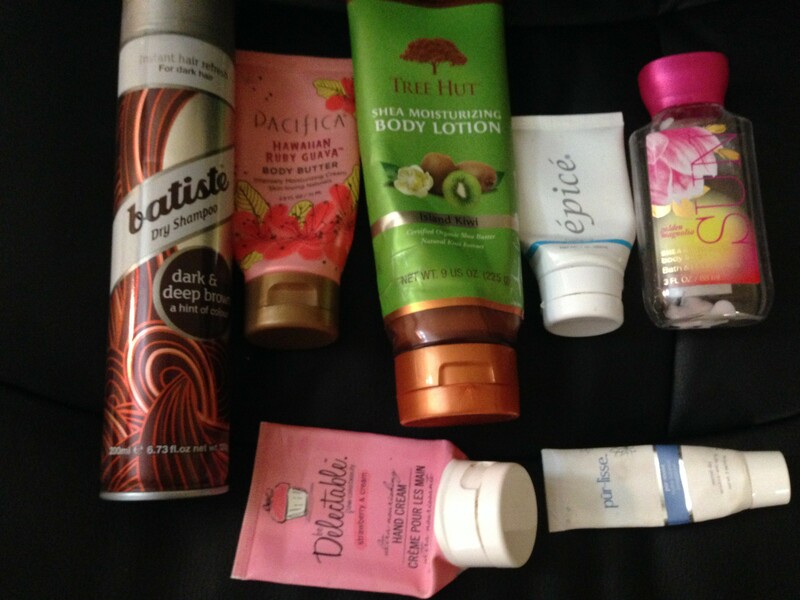 In the featured image, there are a few more empties which I will review in a second blog post just to save you from the monotony of reading about too many products in one go. Love empties posts! Really shows that you enjoyed the products.